You would probably want to accept LinkedIn InMail requests from recruiters even when you aren’t actively seeking new opportunities – or you might be risking burning your bridges without even knowing. As counter-intuitive as it may sound, it turns out that anytime you turn down an InMail request from a recruiter on the popular networking portal, that same recruiter will never be able to contact you again in the future. So in case you want to keep your options open, you might want to accept the request and kindly clarify that you are content with your current working arrangement – this way you at least make sure you’re not pulling the rug from under your own feet. 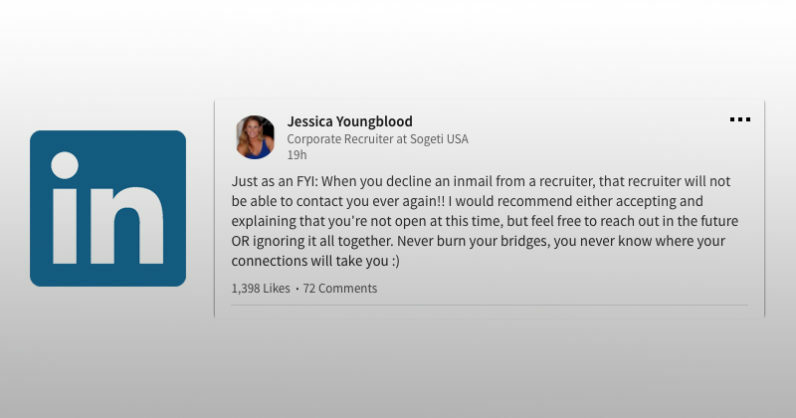 The warning comes from Sogeti corporate recruiter Jessica Youngblood who took to LinkedIn to tip off fellow users and job seekers about this nonsensical user experience choice. As some miffed users have pointed out, it appears LinkedIn didn’t thoroughly think this through. Given how much effort the company has invested into turning its platform into the go-to place for career opportunities, silly decisions like this one could end up limiting the full range of openings potential job seekers might otherwise have had access to. In the very least, LinkedIn should strive to bring attention closer to this detail so users can make informed decisions about what InMail requests they accept without missing out on potential opportunities. We have contacted LinkedIn to confirm whether this is indeed the case and will update this piece accordingly should we hear back. UPDATE 1:51 CST : LinkedIn reached out to clarify that recruiters cannot respond to a specific conversation once you’ve declined the request, but they can contact you in the future with different requests.